L’esodo è il più grande nella storia recente della popolazione curda. Il rischio è la scomparsa dell’etnia nelle regioni siriane. Mons. Warda, arcivescovo di Erbil, racconta il lavoro della Chiesa locale fra i rifugiati. Essi sono soprattutto donne, anziani e bambini. Erbil (AsiaNews) – Oltre 15mila profughi di etnia curda hanno attraversato nei giorni scorsi la frontiera con l’Iraq per cercare rifugio nel Kurdistan iracheno. L’esodo è il più grande nella storia recente del popolo curdo. Mons. Bashar Warda, arcivescovo di Erbil, una della città che sta ospitando il maggior numero di rifugiati, racconta ad AsiaNews: “Queste persone hanno lasciato le loro abitazioni e i loro averi in Siria. Hanno bisogno di tutto: cibo, acqua, medicinali e un riparo sotto cui dormire”. Il prelato spiega che la maggior parte sono donne, anziani e bambini. Gli uomini e i figli più grandi sono rimasti in Siria a combattere contro le milizie islamiste che in questi mesi hanno tentato di conquistare la regione. “Da quando è iniziato l’esodo – continua mons. Warda – la diocesi di Erbil ha dato il via a una campagna di aiuti, raccogliendo beni di prima necessità e creando luoghi in cui accogliere i rifugiati”. Per gestire la situazione, la diocesi ha creato un apposito comitato, il Mercy Charitable Committee, con sede ad Ankawa (Erbil) che si occuperà di inviare ogni giorno viveri e beni ai campi allestiti dal governo. Dall’inizio del conflitto siriano l’Iraq, e in particolare la regione del Kurdistan, ha ospitato oltre 300mila profughi. Mons. Warda lancia un appello per sostenere la popolazione rifugiata: “Abbiamo bisogno di aiuti. Apprezziamo tutti coloro che desiderano aiutarci a sfamare e curare queste famiglie bisognose”. Il prelato sottolinea che la Chiesa caldea, attraverso il suo comitato, compie regolari visite ai campi, per verificare l’effettiva distribuzione dei viveri. “Saremmo grati a tutti coloro che vogliono sostenerci”. 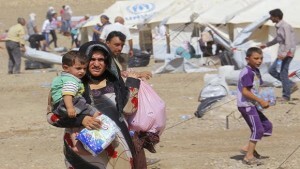 The exodus is the largest in the recent history of the Kurdish population. The risk is the disappearance of ethnicity in the regions of Syria. Archishop Warda of Erbil, speaks of the work of the local church among the refugees. They are mostly women, elderly and children. Erbil (AsiaNews) – More than 15 thousand refugees of Kurdish ethnicity have crossed the border with Iraq to seek refuge in Iraqi Kurdistan in recent days. The exodus is the largest in the recent history of the Kurdish people. Archbishop Bashar Warda of Erbil, a city that is hosting the largest number of refugees, tells AsiaNews: “These people have left their homes and their belongings in Syria. They need everything: food, water, medicines and a shelter to sleep under. ” The prelate says that the majority are women, elderly and children. Men and older children have remained in Syria to fight against the Islamist militias who in recent months have tried to conquer the region. “Since the beginning of the exodus – continues Msgr. Warda – the diocese of Erbil kicked off a campaign of support, collecting basic necessities and creating places to welcome refugees”. To handle the situation, the diocese has created a special committee, the Mercy Charitable Committee, with headquarters in Ankawa (Erbil) that sends food and goods daily to the camps set up by the government. Since the beginning of the Syrian conflict Iraq, and particularly the region of Kurdistan, has hosted more than 300 thousand refugees. Hama, (SANA) _The Cabinet announced on Sunday that Hama governor, Dr. Anas Abdul-Razzaq Na’em was martyred in a terrorist car bomb in al-Jarajmeh neighborhood in Hama city. SANA reporter quoted a source at the Police Command that terrorists detonated the car bomb as the governor’s convoy was passing by in al-Jarajmeh residential neighborhood in Hama city. The governor was martyred and 7 citizens injured, among them 3 children, in the blast. In statements on Twitter, the Al Qaeda-affiliated terrorist group Jabhat al-Nusra claimed responsibility for the assassination of al-Na’em. Dr. Na’em held a postgraduate degree in Internal Medicine from the Faculty of Medicine at Damascus University and was professor of Internal and Thoracic Medicine at the Faculty of Medicine in Damascus University. He was appointed governor of Hama on July 10, 2011 and served as secretary of al-Baath Party branch and the Doctors’ Syndicate chief in Hama. The People’s Assembly condemned with the strongest terms the assassination of Hama Governor, Dr. Anas Na’em, by the armed terrorist groups and the takfiri mercenaries. In a statement made on Sunday, the Assembly stressed that martyr Na’em, along with all the military and civilian martyrs, will contribute to making a brighter future for Syria. The Assembly stressed that the assassination aims at terrorizing the Syrians and dissuade them from carrying out their national duties, adding that the retaliation of the terrorist attack will be exerting more efforts to eradicate terrorism and its tools from the country. The statement hailed the steadfastness of the Syrian people, calling them to exert more effort in cooperating with the state institutions to reveal the terrorist cells as to clear the homeland of those mercenaries who are brought by the western colonization power and its regional tools to destroy Syria and control its national decisions. The Assembly offered sincerest condolences to the family of Martyr Na’em and the families of all martyrs, stressing that the road to victory is paved by the blood of the martyrs, the determination of the people and the sacrifices of the brave Syrian soldiers. Questo articolo è stato pubblicato in Senza categoria e contrassegnato come 438, terrorists assassinate hama governor with car bomb da unius-rei . Aggiungi il permalink ai segnalibri.